DUBAI, UNITED ARAB EMIRATES--(Marketwired - Mar 24, 2014) - Business travellers to Dubai can experience the comforts of apartment living with the convenience of hotel amenities when staying at one of the premier extended-stay hotels in Dubai. Lavishly appointed accommodations and exceptional service are standard at the Marriott Executive Apartments Dubai Creek as these impressive downtown Dubai residences welcome world travellers to relax comfortably during their stay and take advantage of these convenient, fully serviced apartments, many of which also offer serene vistas of the nearby Dubai Creek and downtown. 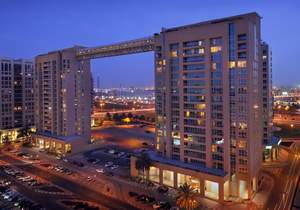 Located within easy reach of downtown business districts and Dubai International Airport, this impressive lodging features two, 18-floor residential towers, connected at the top by the longest pedestrian bridge in the Middle East. Each of the one-, two- and three-bedroom apartments is luxuriously furnished to include a full kitchen, high-tech services and plenty of work space so business travellers have everything needed for a productive stay while enjoying the pampering amenities and personal attention of a five-star hotel. Housekeeping, room service and 24-hour security are all standard so guests can rest easy while enjoying a healthy balance of work and pleasure amidst the relaxing comfort of their Dubai "home away from home". For executive meetings, the property's Residence Lounge features one of the finest serviced boardrooms in downtown Dubai with meeting space for up to 15 persons. During their stay at the Marriott Executive Apartments Dubai Creek, the premier corporate housing option in Dubai, guests may enjoy International menus and all-day dining at the Skywalk Cafe, where tasty fare and friendly service are served in a relaxed and casual atmosphere or venture to the nearby JW Marriott Hotel Dubai for a 15% guest discount at the variety of restaurants offered there. Guests also have access to a well-equipped health and fitness centre, and can relax under the Dubai sky on the hotel's rooftop terrace which features a refreshing heated outdoor pool. The Marriott Executive Apartments Dubai Creek is an exceptional destination for extended-stay travellers offering lavish apartments with all the comforts of home. Featuring spacious living areas filled with Dubai-inspired designs, fully-equipped kitchens, large bathrooms and the convenience of grocery shopping service, this stylish lodging also pampers guests with business and technology amenities including high-speed Internet access, Plug-in panels and International cable/satellite service. The hotel's downtown location puts guests near Dubai Creek Golf & Yacht Club, Deira City Centre and the Dubai Airport Free Zone so they can easily access business and recreational destinations during their extended-stay in Dubai. When traveling to Dubai for business, corporate travelers experience comfort and convenience at Marriott Executive Apartments Dubai Creek.